Today, PoE home security camera systems are continuing to be prevailing than ever before with the simplicity, easy installation and affordability. But with so many claimed best PoE home security cameras and systems out there, where does one even begin? Here we’ve compiled a list to get you started. And don’t worry about your home security getting too pricey – all the PoE security cameras and systems for home we recommend will meet your diverse budget needs. A PoE home security camera system is the video monitoring system with PoE technology that requires single network cable for power supply and video transmission, designed to monitor your house and property around the clock. Normally, the PoE security camera systems for home consist of several PoE home security cameras and a dedicated security camera recorder (DVR or NVR) for video storage. Besides purchasing a whole best PoE home security camera system, you can also buy PoE home security cameras and an NVR separately from the same brand (to avoid compatibility issues), and DIY your own home security camera system with PoE. So, what are the specifications or features to be seen when you are buying a PoE home security camera system? To avoid buyer’s remorse, check out our rundown of the essential factors you should consider before pulling the trigger on the best PoE home security camera systems. We list resolution of PoE home security camera systems in the first place, with good reasons. Because that would directly affect whether you’ll get fuzzy or clear images when usable details are required. And these days, the best PoE home security camera systems have been marching towards greater clarity – an irresistible market trend you need to recognize. Case in point: many reputable security camera sellers are now offering 5MP and even 4K PoE security camera systems for home. It’s easy for you to switch the resolution of 5MP/4MP PoE home security camera systems to 720p or 1080p for less storage usage, but you can’t adjust the resolution of 720p PoE home security cameras to 1440p or 5MP in case that sharper and clear videos are needed. And that’s exactly why you shouldn’t settle on the low resolution PoE home security cameras and systems. Watch the video below captured by a 5MP Poe home security camera. As mentioned above, a PoE home security camera system only need one ethernet cable for power supply and video transmission, thus saving your time and installation cost as well. Are you offered with free security camera accessories required for the installation of PoE home security cameras (like screws, network cables, a screwdriver, etc.)? If you meet any problems in the installation process, will you receive instant assistance from the support team of the security system seller? Read the PoE home security camera system reviews to see if the users can install the system on their own or they have to hire professionals. Below is the wiring diagram of the PoE home security camera systems. The storage space for a PoE home security camera system, also matters if you want to record 24/7 continuously or monitor large indoor and outdoor areas. As a rule of thumb, most PoE home surveillance camera systems are built with a pre-installed HDD for video storage. And some (like Reolink PoE camera systems) also allow you to add an external one to expand the storage space. When searching for the best PoE home security camera systems, do remember to check what alert options (push notifications, emails or buzz from the NVR) you will receive when motion is detected. 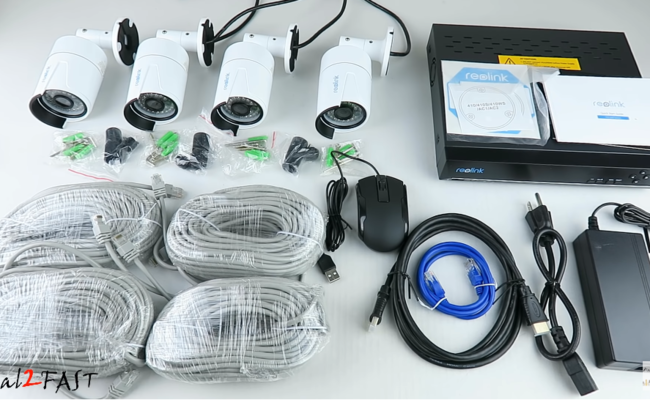 Also, compared with the pay-to-use third-party software, it is more suggested that you use the free and customized security camera viewers from the sellers, so that you don’t need to pay extra fees or sacrifice any features of your PoE security camera systems for home. Doing enough homework will go a long way towards landing you on the best PoE home security camera systems. And reading the PoE home security camera system reviews is just one of the preparations you should make. Taking the Reolink 5MP & 4MP PoE home security camera system RLK8-410B4 for example, below are the reviews from the real buyers and top-tier media. “I am incredibly amazed at how easy it was to setup and configure. Hooking up my cameras was easy as I was able to plug the camera into the router and access the footage from my smart phone”. To help you find your best PoE home security camera system, we picked out our favorite that we recommend giving a try, that is, the Reolink 5MP & 4-megapixel super HD home security camera system RLK8-410B4. This PoE security camera system for home is packed with four 5MP/4MP high resolution PoE home security cameras and an NVR with a built-in 2TB HDD. It is super easy to install and will send you instant push notifications, email and buzz sound when motion is detected. In virtue of Reolink App and Client, you can view the live feed from anywhere on your Android phone, iPhone or PC. Below is the Reolink PoE home security camera system review by the vlogger Dial 2 Fast, which includes the unboxing process, detailed installation steps and video samples. 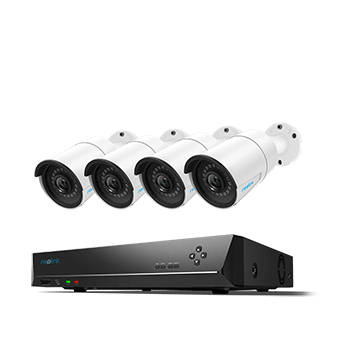 If you intend to put up more PoE home security camera systems, this 16 channel PoE home security camera system RLK16-410B8 can be your best bet. Most of you may regard the wiring process of a PoE home security camera system as a BIG headache. So we’ve got this part to offer you step-by-step instructions. 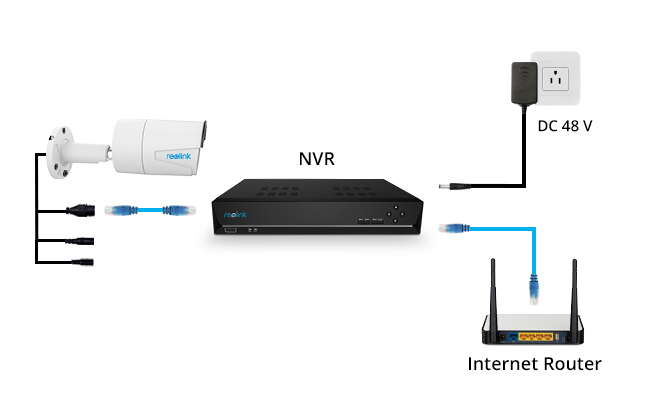 Step 1: Plan ahead to decide where to place the PoE home IP cameras and the NVR. Step 2: Drill holes and run the wires for your PoE home IP security cameras. Step 3: Connect your PoE home surveillance cameras to the designated NVR port via ethernet cables. Plug the NVR into a power outlet and turn it on. Step 4: Connect the NVR to your home router with network cables and then connect the NVR to the monitor via a HDMI cable. After connecting, turn the monitor on. Step 5: With everything in place, you can expect to get clear and sharp videos on your monitor. Taking the Reolink RLK8-410B4 PoE home security camera system as the example, this video instructs you how to connect the cameras to the NVR and your monitor in 2 minutes. Other than the best PoE home security camera system recommendation and installation, here we’ve collected some hot questions you might also have. And please feel free to comment below if you have more to ask. Well, that depends on whether you buy the wireless camera and the PoE home security system from the same brand. For example, you can add a Reolink wireless IP camera to its PoE home surveillance system (here is the guide on how to set up). Again, it demonstrates the great flexibility and scalability of PoE home security camera systems. Here is the thing: the PoE home security cameras and the NVR connect to each other on their own proprietary network. That is to say, a PoE home security system can still do 24/7 recording without Internet access. But real-time alerts and remote viewing will NOT be available with no network. This entry was posted in Buyer's Guide and tagged home security, installation, PoE security systems, smart home.